Fall is officially here, and even though it may not feel like it in Texas I'm mentally preparing for cool nights outside! Our home has a great fire pit in the center of our backyard perfect for hosting a campfire with friends. I love party planning and hosting friends, so I've gathered up a few items from Wayfair that I believe would help me in throwing the perfect outdoor Fall party! Thankfully my back porch has a deck that is very accommodating and a great space for parties. First, I would choose a serving cart like the one below to lay out supplies for s'mores and coffee cups for apple cider or hot chocolate. I would decorate with a magnolia wreath, plaid napkins and pumpkins! 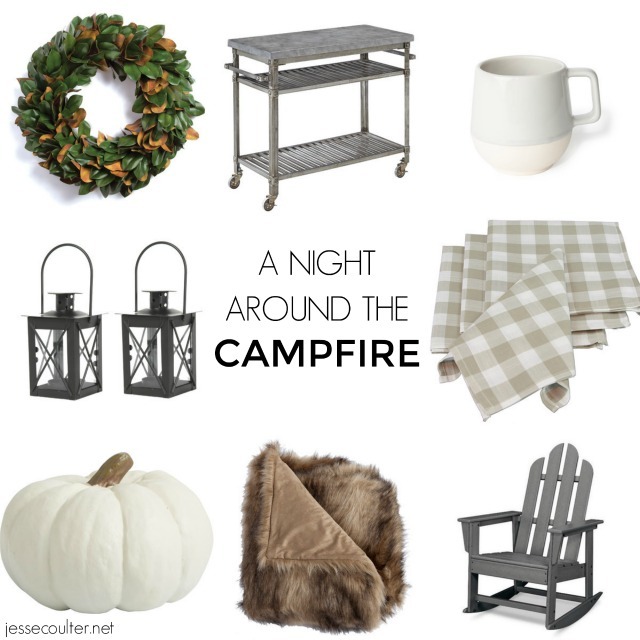 By the fire I would set out adirondack chairs, glowing lanterns, and cozy fur throws in case anyone gets cold! For party invites, I would keep it simple and send out an Evite to all my guests with a Fall theme! Now tell me, do you enjoy hosting parties? If so, what type of Fall party would you want to plan?! I've teamed up with Wayfair for this post, but all opinions are my own. Thank you for supporting the brands I love! Check out more seasonal items on Wayfair here. Oh I love all of this!